MENTORS AND MAKERS: The Artists of Westmont College, at Sullivan Goss Gallery. 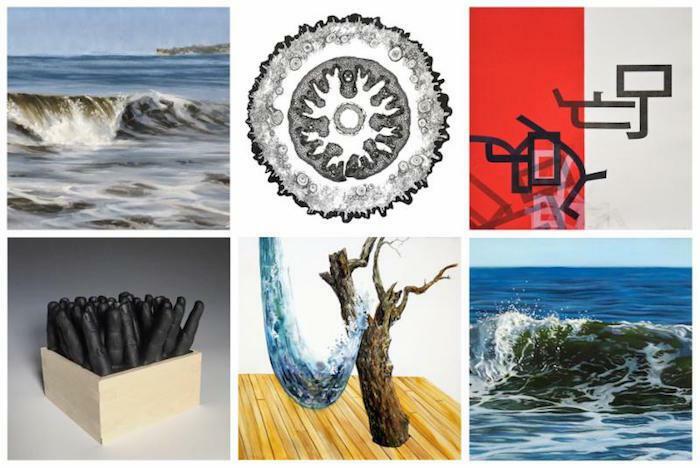 As part of its continuing commitment to exhibit the work of talented emerging artists alongside important established and historically significant artists, Sullivan Goss Gallery hosts an exhibition of works by the art department faculty of Westmont College. Mentors and Makers: The Artists of Westmont College opens on Dec. 6 with a 1st Thursday Reception from 5-8 p.m. The exhibition remains on view through Jan. 20. The art department at Westmont College has always had an outsized influence on the art scene of the region. But tucked away in its bucolic Montecito campus, it can be easy to overlook how much concentrated talent is found there. “Currently, Westmont’s arts faculty consists of some of the most intriguing, adventurous, and distinct artists working in and around Santa Barbara, though their work is making waves over a much larger area,” says Curator Nathan Vonk. Scott Anderson received his M.F.A. in illustration from The University of Hartford, and an M.A. in illustration from Syracuse University. His illustration work has appeared in numerous publications, including The Wall Street Journal, LA Weekly, The Village Voice, Variety, The Hollywood Reporter, and many others. He has also created numerous book covers for the popular “Who Is” series from the Grosset & Dunlap division of Penguin Books. His work has been awarded and recognized by Communication Arts, American Illustration, the Society of Illustrators New York, the Society of Illustrators Los Angeles, and in multiple volumes of Spectrum. A gallery painter as well, Anderson exhibits his figurative work annually with Sullivan Goss Gallery. 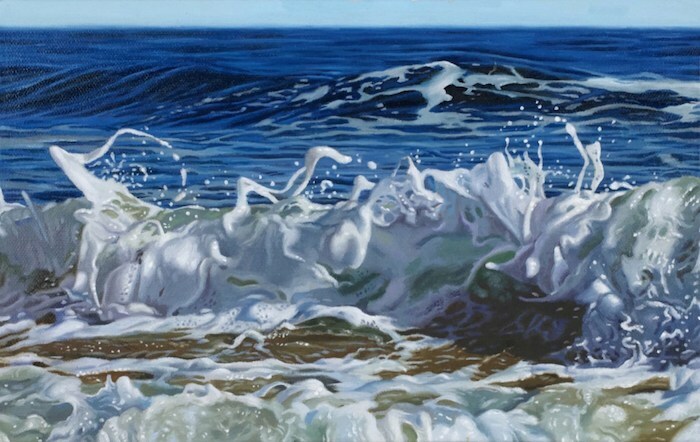 Scott Anderson, Wave 2, 2017, 7 x 11,” oil on canvas, on view at Sullivan Goss Gallery. James Daly focuses on figurative work and classical methods in various genres. Most recently his art has been an exploration of movement, visual memory, and experience in the outdoors. 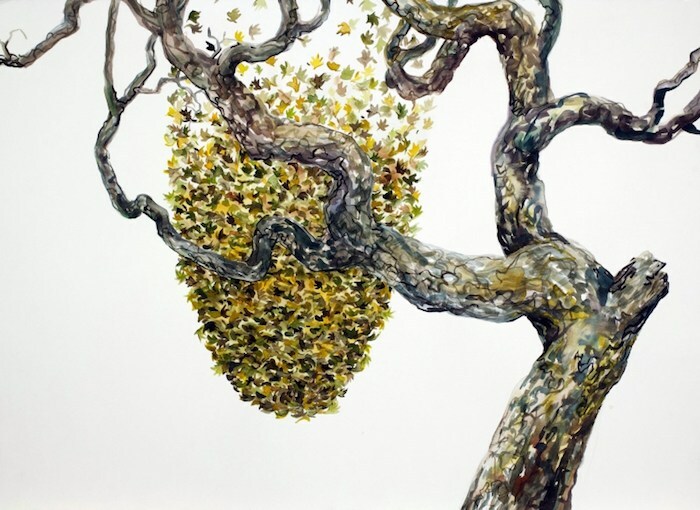 Daly is a graduate of Westmont and UCSB with degrees in Studio art and a Masters in Education. For the last eleven years he has developed a classically based curriculum that follows atelier-style art education for Providence Upperschool and more recently joined Westmont as an adjunct instructor. James Daly, Haskell’s Sunset, 2018, 6 x 8 inches, oil on board, on view at Sullivan Goss Gallery. Nathan Huff, Skies and Schisms 5, 2018, 22 x 30 inches, gouache on paper, on board, on view at Sullivan Goss Gallery. Sommer Roman was born and raised in California. She received her BA from UC Santa Cruz in 2004, and her MFA from UC Santa Barbara in 2014. She maintains a multi-disciplinary practice spanning sculpture, painting, and drawing and teaches part-time at California Polytechnic University (Cal Poly) & Westmont College in Santa Barbara. Some of her recent projects & exhibits include: Left Coast; Recent Acquisitions of Contemporary Art, a group exhibit at the Santa Barbara Museum of Art; Out of the Great Wide Open, a group exhibit at the Museum of Contemporary Art Santa Barbara; Artist Residency & culminating solo exhibition, Passage at UC Santa Barbara; Artist Residency at The Squire Foundation, and most recently, In the Woods, Perpetual Youth, a solo exhibit at Ventura College. Sommer Roman, Sighting no. 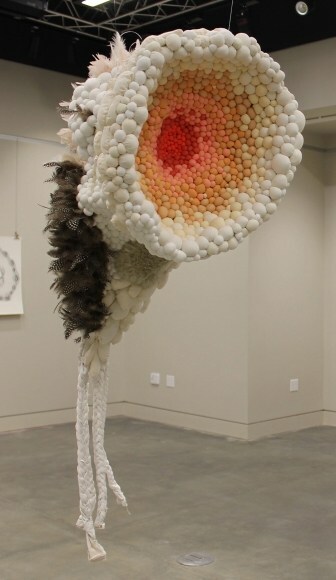 542, 2018, 55 x 20 x 26 inches, reclaimed fabric, clothing, pillows, feathers, paint, on view at Sullivan Goss Gallery. Chris Rupp received his BA from Westmont College and an MFA from Azusa Pacific University. While trained primarily as a sculptor, Rupp does not limit his art making to traditional sculptural mediums or even three-dimensional forms. From graphite drawings, to molded plastic, or the use of unconventional store bought materials. 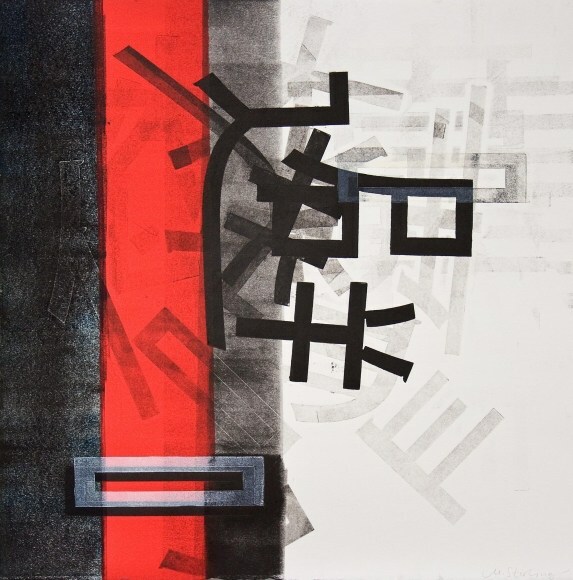 His work has been exhibited at the Inland Empire Museum of Art, Biola University, Westmont Ridley-Tree Museum of Art, San Luis Obispo Museum of Art, The Channing Peake Gallery, and the Santa Barbara Arts Fund. 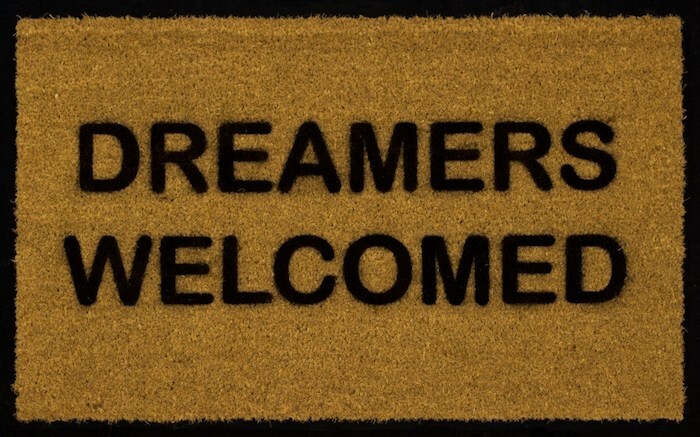 Chris Rupp, Dreamers Welcome, 2018, 18 x 30 inches, acrylic enamel paint on coir door mat, on board, on view at Sullivan Goss Gallery. Meagan Stirling, Everlasting Arms 5, 2018, 16 x 16 inches, Drypoint and Monoprint, on view at Sullivan Goss Gallery. Sullivan Goss – An American Gallery, is located at 11 E. Anapamu St. in downtown Santa Barbara. Originally published in Santa Barbara Seasons on December 2, 2018. New Sullivan Goss Gallery owner Nathan Vonk is flanked by his colleagues and fellow curators Jeremy Tessmer and Susan Bush. Courtesy photo. The link between Burning Man’s annual bacchanal festivities and Sullivan Goss Gallery’s 30-plus-year legacy of celebrating important 19th-, 20th– and 21st-century American art may seem tenuous, but it was a visit to Burning Man that first sparked Nathan Vonk’s interest in art and the friends he made in the desert that first brought him to Santa Barbara. 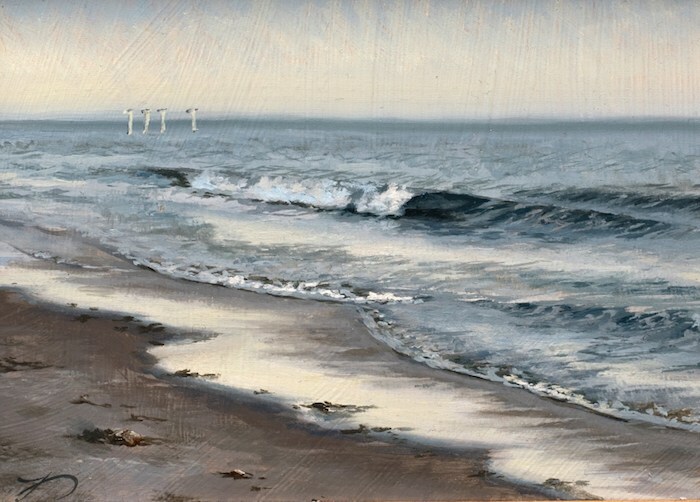 Armed with a master’s degree in post-modern literature theory, Vonk taught night school at Ventura College and walked dogs during the day. He eventually bought out the owners of the dog business, ran it for a few years and then sold it for a profit, right before the market crashed in September of 2008. So happy, in fact, that when Goss told the team (which includes Tessmer and fellow curator Susan Bush) he planned to retire after 2016, Vonk bought the gallery because he wanted to make sure the legacy continued, with its staff intact. “If you think of arts in Santa Barbara as an ecosystem, the part that Sullivan Goss fulfills—if that goes away, the whole ecosystem suffers greatly and it’s not a part that someone is going to step in and fill that void. That was a large part of my motivation to take on the risk of running a commercial gallery,” says Vonk. The herd is back! Brad Nack‘s 100% Reindeer Art Show opens this Thursday, Dec 3 at Roy (7 W. Carrillo St.) with an opening reception from 6-8 p.m.
As has become a local tradition (and very fun event , the exhibit features elegantly framed, small oil paintings of reindeer in the back room for one night only. This year, the front room will also feature a series of larger reindeer paintings that will remain on display through the end of the year. Originally published in Santa Barbara Seasons Magazine on December 1, 2015.